Dedication of Land for Major Thoroughfare Roads in The Woodlands- What Is the Benefit to Taxpayers? 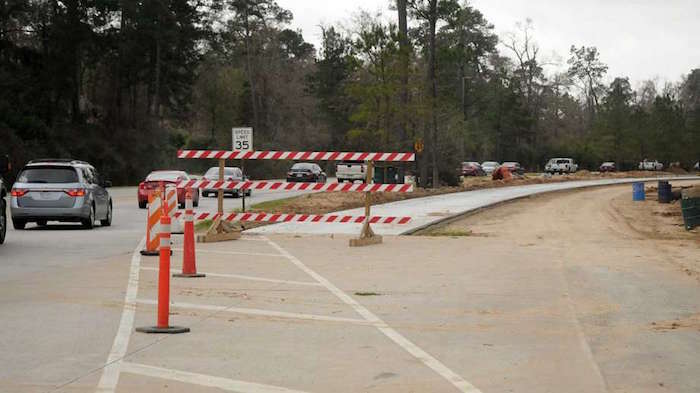 Since its inception, The Woodlands Development Company has dedicated the full road rights-of-way based upon the estimated “build-out” to Montgomery County. In the case of major thoroughfares, this dedication of land consists of rights-of-way 130’ to 494’ wide along 35.73 miles of roads and totaling 772.3 acres of land including right-of-way for 3 grade separations at major intersections. Improvements included widening of the pavement section to 84’ and the right-of-way to 130’ typical to 200’ at drainage outfalls. Right-of-way acquisition totaled 36 acres at a cost of $8,108,000, or an average of $5.15/SF. The land acquisition was funded entirely from the taxpayers of Montgomery County and totaled more than 20% of the construction cost of the project. Of the 108 parcels acquired, there were no donations of land. The subsequent widening of FM 1488 from FM 2978 to Mostyn required acquisition of 34.6 acres at a cost of $7,856,000, or an average of $5.21/SF. Of the 138 parcels acquired, there were no donations. What would be the result if major thoroughfares in The Woodlands had been developed similar to FM 1488? In this hypothetical example, The Woodlands Development Company would have dedicated the minimum 100’ right-of-way initially. The balance of the right-of-way would have been condemned by Montgomery County after development had already occurred and roadway pavement widening was required. Using the same value for acquiring land along FM 1488 from I-45 to Mostyn Road at $5.16/SF, the cost to the taxpayers of Montgomery County to acquire the additional 339 acres in The Woodlands would be a staggering $76 million!